We consider any event the big event—no matter the size, no matter the importance. Whether it's business or social, serious or fun, we believe that your affair deserves our utmost attention. Consider Cuba Libre Restaurant & Rum Bar for your next social (wedding, birthday, anniversary, baby or bridal shower, quinceanera, sweet sixteen, bar/bat mitzvah, christening, bachelor/ette) or corporate event. Whether it’s an intimate party, a grand event, a themed cocktail party or an elegant dinner, Cuba Libre is the ideal setting for an unforgettable private party or special event. In the heart of beautiful, historic Lansdowne, the Twentieth Century Club awaits you and your guests in a gracious, one hundred year old, arts and crafts style building. Ideal for any event, large or small, the club can host your group, from an intimate gathering of 50 to a large party of 175. Our foyer welcomes your guests, where antique architectural elements abound, including dark walnut accents and stunning oak floors. Enjoy cocktails on our terrace, glimpse beautiful views of our garden through our large, picturesque windows or just relax in the luxury of a turn-of-the-century club. Located just South of Baltimore Avenue, along tree-lined Lansdowne Avenue, the club is close to Center City Philadelphia and the suburbs and fully accessible by train or by car. We are happy to assist you with all the details of your business function, shower, wedding reception, rehearsal dinner, bachelorette / bachelor dinners, birthday celebration, sweet 16, anniversary party, divorce party, celebrations of life, holiday parties, and short notice repast. Guests will enjoy the freshest seafood, succulent steaks and impeccable service in a setting that only Chart House can provide. Perched high above New Jerseys largest marina the Farley Marina and connected to the Golden Nugget Hotel and Casino via accessible sky walk, Chart House is the perfect location for your next special event in Atlantic City. Our beautifully-appointed Marina Room offers unparalleled views of the Frank S. Farley Marina. By reserving our Marina Room, your party of up to 70 guests will be mesmerized by magnificent views of the glittering Atlantic City skyline. For smaller events, the intimacy of our private roof top dining loft, cannot be beaten. For up to 30 guests, this roof top dining loft is the perfect spot to be surrounded by birds eye views of the Atlantic City skyline and harbor. Our chef has arranged multiple unique menus, meaning your event can be customized just the way you imagine. No matter what type of event you are hosting, we are prepared to make it unforgettable. For your next birthday, anniversary or retirement celebration, consider the intimacy of private dining at Chart House. Just steps from the beach, the Surf City Hotel is ideal for private parties, wedding receptions, rehearsal dinners, reunions, banquets, and cocktail receptions of all kinds. The private dining room can accommodate from 30 to 200 guests. Surf City Hotel's experienced catering and banquet staff will handle every detail to make your event unforgettable and stress free. It is the perfect location for a beach destination wedding. We can help you plan and decorate for your special wedding day, as well as the rehearsal dinner and breakfast buffet. With 29 hotel rooms, the hotel offers you and your wedding guests a place to stay at the beach and attend all of your wedding festivities. The Mansion on Main Street is a picturesque events venue wrapped in elegance and modern beauty. Situated amidst exquisitely manicured grounds, lush gardens and a large cascading waterfall in Voorhees, New Jersey, this breathtaking property is ideal for gatherings of any kind, including but not limited to weddings, corporate events and celebrations. Enjoy all the amenities of an urban venue in a quiet, comfortable setting. The Arts Ballroom Catering and Events is Philadelphia's premiere special events venue located directly off the Avenue of the Arts within walking distance to the Pennsylvania Convention Center. This all-inclusive venue is where cultural sophistication and diversity meet tradition and history. Formerly the Sylvania Hotel, this stunning 1920's Art Deco-inspired building features a two-story grand hall, Sylvania ballroom, and mezzanine. The Arts Ballroom offers historical distinction and contemporary style for elegant events that create lasting memories. Unforgettable events are a sure thing at Philadelphia's most exciting venue. At SugarHouse Casino, there's no limit to the fun in store for you and your guests on your celebration or event. Picture-perfect magic happens fast in The Event Center, a beautiful and spacious ballroom with panoramic waterfront views and exceptional amenities. You and your guests will also enjoy food a cut above the rest, with acclaimed catering from Chicago's Gibsons Restaurant Group. As the only restaurant group in the world with a USDA beef certification above Prime, Gibsons never fails to bring sensational flavors to the table that your guests will talk about for a long time to come. Our dedicated team will help customize your event to your unique tastes, down to the smallest details. We make sure everything's just right, so you can let loose and enjoy yourself when the time comes. And the party doesn't have to stop! Playtime awaits in the city's most action-packed gaming floor. Plus, driving is that much easier thanks to convenient free parking. You'll have it all and more at SugarHouse Casino. Make your big day epic with Signature Events by SugarHouse Casino. Christina's Catering - 35 years of catering experience! 2019 - The Knot & WeddingWire Awards for Best Catering! Contact us today to discuss your event at The Ballroom at Westside or our other featured venues from Philadelphia to Lancaster & New Jersey -Other Great Wedding Packages from $70 to $130 (Barns, Mansions, Waterfront, Tented, Ballroom, Museum & other Unique Venues) ~Special 2019 special packages starting at $69.99* with Full Bar Package Other packages avail. $69.99+ -$125+ Full Wedding Package Discounted Indoor or Outdoor Wedding Ceremony Option ~ Ask about other unique Venues ~ catering quotes at your facility-call us! TheBallroom at Westside is "West Chester's Hidden gem". Christina's Catering, an award winning and locally owned special event caterer, is proud to showcase this venue specializing in Weddings, Corporate Events, Banquets, Themed or Holiday Parties, Social and other Gala Events. The Aspen Room, is our stunning reception area, with a soaring A frame ceiling, stone fireplace, and marble and ceramic accents throughout the room. Your guests will marvel at the intricate woodwork and marble bar. This reception area will immediately set the tone for your guests as they enter into the magnificent Ballroom at Westside. 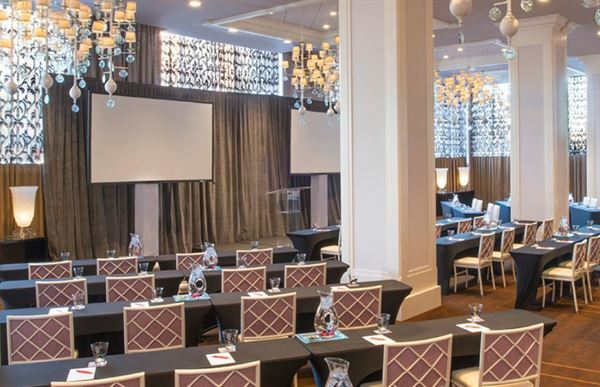 Featuring state of the art audio visual equipment for wedding receptions, corporate or school banquets or black tie galas, The Ballroom at WESTSIDE is the premier location in West Chester. Contact us today to create a memorable event at The Ballroom at Westside!